When I first tried sushi I didn't like it; I couldn't figure out what the big fuss was about. But then out of nowhere I started craving it and the more I had, the more I liked it. The Vampire Diaries is like sushi to me. I didn't particularly like it at first, then I started getting interested in it, and now--despite numerous other vampire shows keeping me occupied--I'm actually excited to see it again. 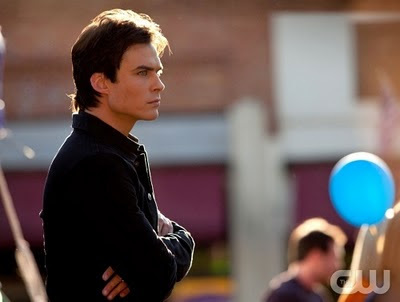 I blame it on Damon, who, as far as I'm concerned, is the best (and yeah, hottest) vampire since Spike (sorry, Bill). To get us in the mood, the CW has released trailers for the upcoming season of TVD. Watch the extended version here. While you're at it, watch a short video update of Damon here. The Vampire Diaries returns Thursday, 9 September. I know I'm marking my calendar.